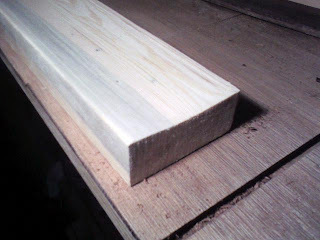 Decided to make a sanding block for the fret-board curving. 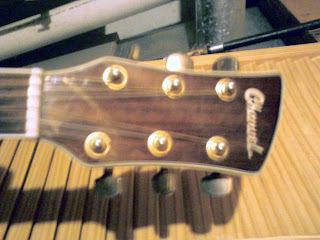 Most steel-stringed guitars have a rounded off fret board to help make barring (index finger across all strings) chords easier. I decided to go with a 16" radius. I drew it up on the computer, then traced it on the edge of a two by twice (from pallet-wood) then routed down the length to the correct depth for each pass. Then I used 80 grit sand-paper on my orbital sander and smoothed it all out. LMI sells these blocks for about $20 by the time you pay for shipping... I didn't want to pay that much. Turned out nice. This is about all I accomplished over the week because I was busy at work and the wall. Also I wanted to note my older post about designs for head-stock... Well the design I liked was VERY much like one of my current guitars... my Charvel. I laughed when I saw this, I thought I had come up with a very cool unique design, when actually I came close to copying my own 6 string.... Back to the drawing board I guess. woow! nice post! From a simple wood to a designed wood.